Today is the 20th anniversary of the fall of the German Wall. I must admit, I only have vague memories of that particular day. I was 14, and lived in a small town in East Germany. The whole euphoria of this achievement arrived in much smaller quantities in sleepy small towns. And I, as a 14-year old, probably had other things on my mind too. However, I most certainly do remember the times before and the radical changes in the times after very well. One of the big and exceptional experiences of the time before was when our family moved to China for two years in the early 1980s due to my dad's job. Just to remind you, East Germans were not allowed to travel, apart from communist eastern European countries. I have very vivid memories of China, of places, foods, etc. Little details that I wouldn't remember of Germany. It was just one big adventure that would not happen twice. One of our favorite foods there were filled Chinese dumplings with minced pork fillings, dipped in soy sauce. We knew them as Jiao Zi. It's quite a time-consuming dish to prepare. Therefore, in China it is often served when having guests or around New Year as something special. I never had Jiao Zi outside China as I never found them in Chinese restaurants around the globe. When I found a recipe that pretty much resembled my memories of the Jiao Zi and the memories of my mother of how they were prepared I gave it a go. They turned out really well. I enjoyed them as much as I did 25 years ago. 25 years ago......25 years ago....... Unbelievable, how time flies and how vividly memories of smells and tastes stick to your brain. Put the flour in a bowl. Add water gradually in small amounts and knead into the flour. Once you start doing this, you’ll be able to judge how much water is required. The dough should not feel too hard, soft or sticky. Cover dough in bowl with a damp tea towel and leave for 30 minutes. Finely chop the cabbage or baby leeks. Heat the oil in pan over medium heat. Mince the garlic and fry together with the grated ginger. Add the cabbage/leeks and pork and stir. Add the cooking wine, soy sauce and salt and continue stirring over low to medium heat for about three or four minutes. Set aside to cool for a few minutes. Knead the dough a little more. If the dough is too sticky, add more flour as you roll the wrappers out. Dust surface with some flour and cut dough up into small pieces. Form small balls and roll them out as thinly as possible (approximately 8cm in diameter). You’ll have to judge the correct thickness. If they’re too thick, they won’t taste nice, and if they’re too thin, the possibility of tearing is greater, especially if you’re going to boil them. Place a teaspoon of filling onto the centre. Don't use too much filling as the wrapper will tear. Fold the wrapper in half and press together to form a half moon shape. Pinch and pleat just one side of the wrapper. Seal tight so that there are no gaps. Keep the dumplings covered with a damp towel if you don't cook them immediately. Combine all ingredients for the dipping sauce. Heat plenty of water in a saucepan. Add some oil and salt so the dumplings will not stick together. 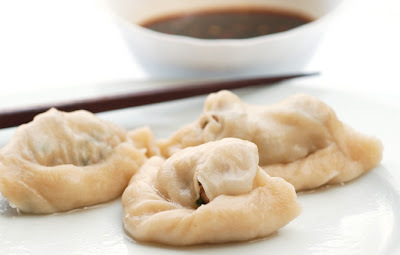 Boil the dumplings in small batches, for 5 to 7 minutes, until the wrappers became soft but not gooey. If you make them in batches, add some cold water to the saucepan and bring to the boil again, to dilute the water. The flour from the wrappers thickens the cooking water, so the next batch will take longer to cook. Repeat this if necessary after making each batch. Serve hot with plenty of dipping sauce or just simply soy sauce.